Článek popisuje model (základní moduly, funkce a jejich vazby) pro simulaci umělé inteligence. Model je založen na dvou pojmech: Concept a Idea. 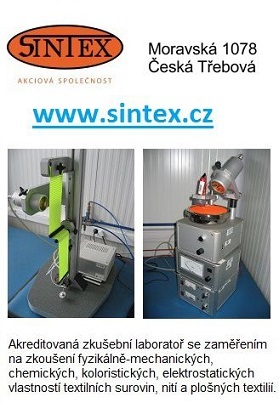 Spolupráce mezi těmito dvěma pojmy je popsána tak, že dokáže simulovat "myslící" bytost. Jak řekl René Descartes: Cogito ergo sum (myslím, tedy jsem). This article proposes model (basic modules, functions and their relations) for simulation of an artificial intelligence. The model is based on two items: Concept and Idea. Collaboration between these items is described so that it can simulate a “thinking” creature. We studied many literatures about the AI philosophy, abilities of current computational systems, new propositions of modern neural networks, comparison with the neurological description of a human brain. 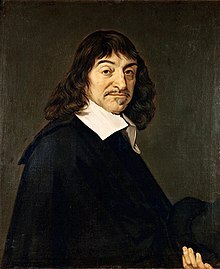 Nevertheless, we can simply rely on the thought of Rene Descartes: Cogito ergo sum (English: "I think, therefore I am") . Concept (sometimes “Item”) represents some object with his properties and in proper hierarchy (also “class” in mathematics). In contemporary philosophy, there are at least three prevailing ways to understand what a concept is . Idea represents relation between concepts. This is interpretation from Plato and Democritus philosophy – Theory of Form . After that, it was necessary to create theoretical model of a machine, which is able to work with concepts, create ideas as abstraction generator. Also, this machine must give proper response to an input event and must be able to work internally with internal concepts. The machine must be able to work without external mover and must be able to process natural vagueness. The basic problem was how to implement an abstraction process. We found that it is necessary to implement 5 elementary logical functions, sequence and amount interpretation. With these functions, it is possible to simulate all most complex ideas. As it is clearly seen from the detailed description, real implementation of the whole machine is not suitable for current most prevailing computer concept (processor, memory etc.). It is suitable for simple implementation by neural network. We tried to verify our concept in reality on standard computer. It was a hard work to program it on the computer, but we succeeded. Every, who tried to make an AI model will agree that the most difficult thing is to make a data set for testing. This data set must be small, but consistent, because of small hardware possibilities of the testing machine. This article does not want describe the thinking machine in details. It wants to describe the main principles and main modules. Otherwise, it should be able to write a book for each module. Active memory contains all concepts in the form of “hardware” and “software” items. Hardware item is active if all input ideas activating this item are fulfilled. It is hardware wired. Software item is active if all input ideas activating this item are fulfilled, but it is not hardware wired – conditions are temporarily defined only. Schematic difference between these two items is displayed on the following picture showing hypothetic interpretation in the living systems. Realization in the artificial neural networks is similar and simple. “Hardware” items are directly wired in the network. Individual dendrites (inputs) and neuron cell realize the logical function between input dendrites. This realization has quick response and is stable. “Software” items activate the proper cell only if external programming signals modify the internal dendrite logical function so that it corresponds to the required function. Software realization of the logical function is not as quick as hardware wiring, but it processes the function in real time. The picture displays simplified schematic function of a neuron in living system . Neuron cell collects analog electric signals from individual dendrites and if it exceed certain level (-55 mV), it rapidly changes the electric potential in one output axon (up to 100 mV – principle “all or nothing”) sending this output to another cells via synapses. After that the signal relaxes to the original “zero” level (up to 100-times per second). 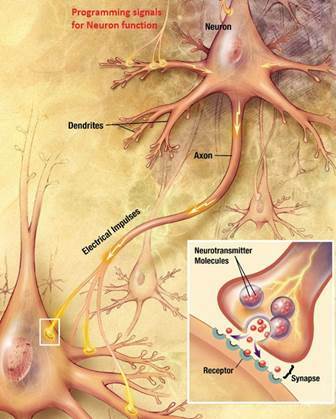 One neuron may have up to 200 000 connections to other neurons (electrical  or chemical synapses). Everybody can say: but what to do, if individual neurons are very distant and represent different areas of thinking? For example: if I say “AIDS”, there must be an idea connecting it with the English language term “Acquired” and the artists name “Freddie Mercury”. This is not possible by simple direct dendrite connection during the learning and software phase. It must be able to address distant neurons and include them into the idea. Human brain has about 1010 neurons in Cerebral cortex, which is in area of our interest. From the theory of information, it is necessary to have 34 bits of elementary information to address certain neuron. And, with necessary redundancy 3x, we will need about 100 bits. What does it mean? We need at least 100 software driven dendrites to create a logical function managing the output relation. How to do that? There are many ways how to implement it. We can save the information based on a spatial recognition (behavior on each synapse connection) or time-based recognition (time sequence of signals). Implementation can be done in the distributed memory too. But here we are on the “dark” field of the informational theory, so let we keep it as a hypothesis only. This module is relatively simple. It monitors the situation in the Active memory and if more items (neurons) for some concept are activated simultaneously, it creates a new item connecting them (on the software basis). Concept generator may be intrinsic part of the Active memory. This module is very important module available for humans only. It creates interconnection between concepts based on idea – logical function.Interconnection is represented by active item which is activated if input concepts fulfill the proposed logical function. This function is represented on the software basis only in the generation phase. Activated items fulfilling one logical function may be chained into more complex formulation (molecular formulas). All complex formulations may by expressed by the set of simple logical operations (atomic formulas) understood by the Active memory. 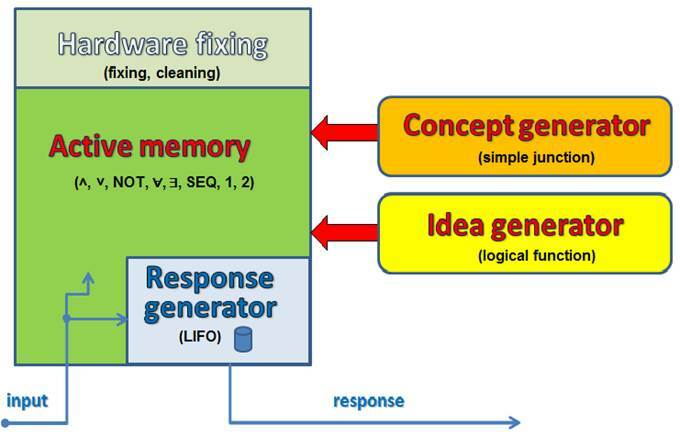 Idea generator may be complex, but the random testing of logical operations between 2 concepts is sufficient. Idea generator performs operations which may be called “thinking”. It is the realization of inference missing in other AI simulation machines. Fix software operations (logical functions between concepts) into hardware wiring. It selects the mostly used, most simple and operations fulfilling other conditions for fixing. Removes hardware and software connections which are not suitable for thinking process. It selects the unused connections, but also the connections generating outputs in conflict with other connections. Both processes are running during the sleeping. Sleeping is the necessary phase for “cleaning” of the Active memory. Responses are not a clear list of simple actions; it must accommodate every action to the actual conditions, change them and take into account many considerations. Human brain is more complex than intelligent system described above. It contains specific areas helping signal processing for specialized actions. These areas are like: speech recognition and creation, motoric system, vegetative system, limbic system, visual processing, listening processing etc. This article describes principles of the intelligent function realized in the Cerebral cortex only. This article described how to create artificial intelligence system from individual components. Each component has role, which cannot be simply replaced by imprudent accumulation of components realized by any way (classical computation, signal processing or neural network). We are on the beginning of the understanding intelligent systems. But we want to say, that the above mentioned principle may be valid for any hardware realization (inorganic-organic, differentiated-distributed etc.). Intelligent system which cannot be distinguished from the human response fulfills the Rene Descartes thought: Cogito ergo sum. The most common source of information was Wikipedia (www.wikipedia.org).Simply search items like: “Philosophy of artificial intelligence”, “Artificial intelligence”, “Artificial brain”, “Artificial consciousness”, “Neuron” and related links. 2. Principles, I. par. 7., compare also Meditation II. 9. a Debate IV. 3. Eric Margolis; Stephen Lawrence. "Concepts". Stanford Encyclopedia of Philosophy. Metaphysics Research Lab at Stanford University. Retrieved 6 November 2012. 4. Modern English textbooks and translations prefer "theory of Form" to "theory of Ideas", but the latter has a long and respect tradition starting with Cicero and continuing in German philosophy until present, and some English philosophers prefer this in English too. See W. D. Ross, Platos Theory of Ideas (1951). 8. GUYTON, Arthur C; HALL, John E. Textbook of Medical Physiology. 11. ed. [s.l. ]: Elsevier, 2006. (11). ISBN 978-0-7216-0240-0. S. 782–784.